I was having a really hard time picking a venue. We are from New York, so I wanted a New York wedding in North Carolina ... which is pretty impossible. Up North, it's all about ballrooms and down South, it's all about backyards. We looked at 50 venues online and 15 in real life, and I couldn't find exactly what I wanted. In theory, I'm convinced that this is the universe's way of telling me that I should open a venue down here in North Carolina. But, realistically, it was life's way of telling me that no matter what I pick, it will be perfect because the venue is just a place to hold a party that celebrates that Pete and I love each other so much that we're going to fuse into one and love each other for the rest of our lives. So I finally picked a venue -- and a date. When we finally picked a date, I didn't just want to call my family and tell them. Maybe it's narcissistic and self-indulgent, but I wanted to tell my family in a cutesy way. I wanted it to be something more memorable than a text. 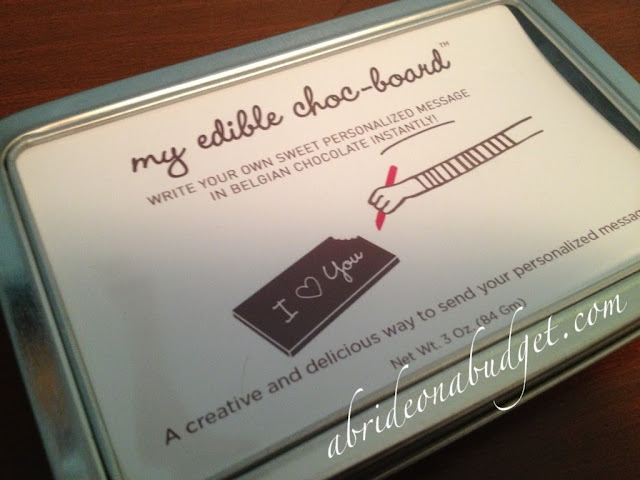 I wanted it to be on the My Edible Choc-board from My Cup of Cake. It's super cute. It comes with a chocolate chalkboard, a wooden stylus, and a bag of sugar that looks, well, like something you probably shouldn't be carrying around if you have any chance of getting pulled over by the cops. Using it is a lot easier than I thought. 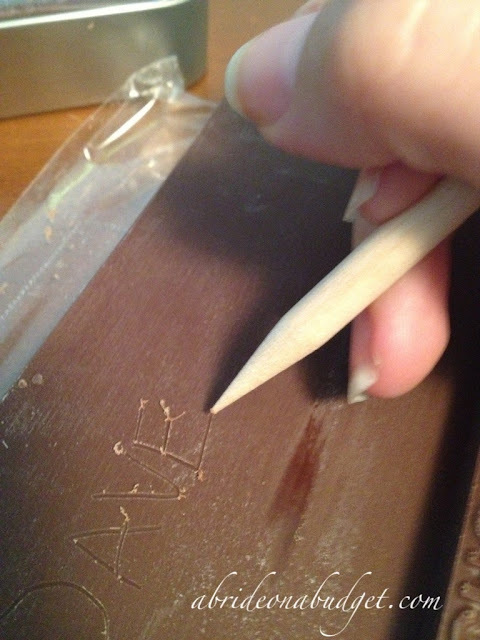 You take the stylus and write on the chocolate. I actually had to do it twice because I was too gentle the first time and the grooves weren't deep enough to pick up the letters. 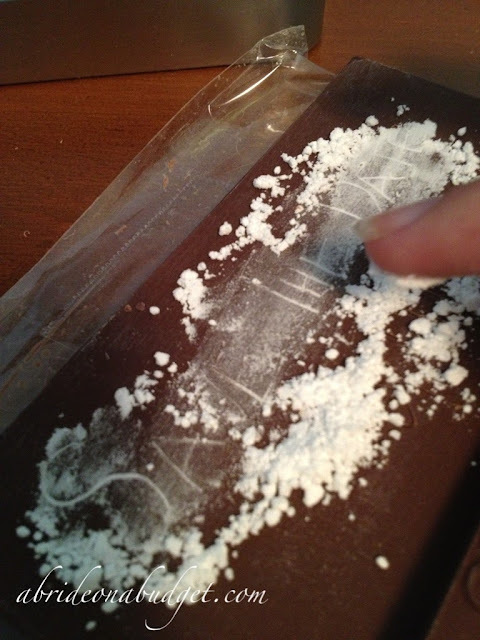 You can actually see some smears because I originally wiped the chocolate with a wet towel. Yeah, don't do that. Stick to dry. Trust me. 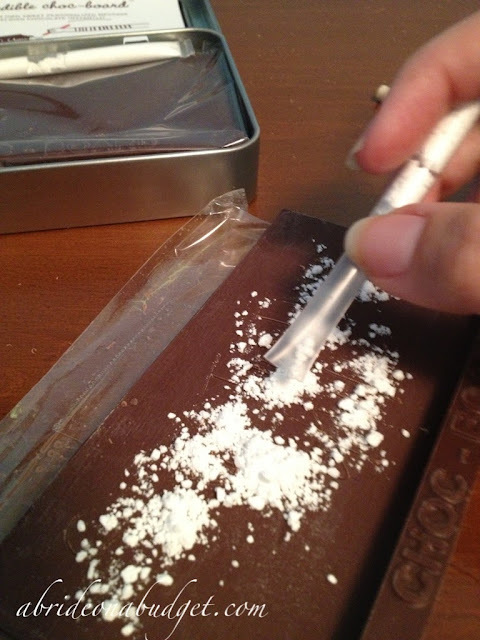 Spread the powdered sugar over the bar. 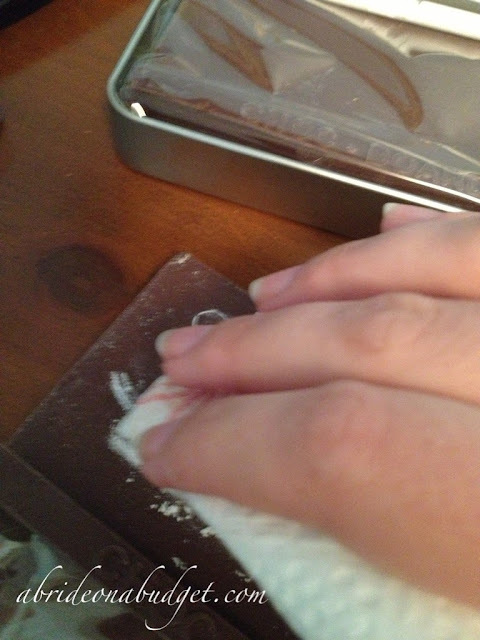 Spread it with your fingers (to make sure it gets in the grooves). And tada ... like magic your words appear (or okay, not at all like magic). I put the chocolate board back in the box it came in to present it. If you can't find this, don't worry. You can make a version easy. 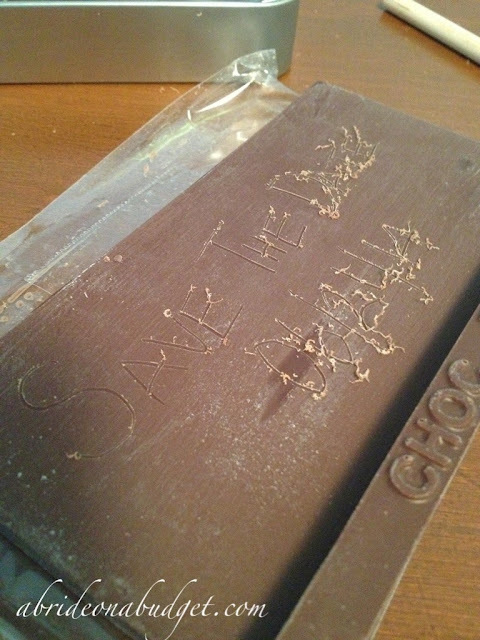 Buy a Hershey's bar and use a toothpick to write on the backside of it. That side is a flat surface. Then, you can just put it on a cute plate to present it. And how did we, you ask? Pete and I drove to New York to surprise our families for Father's Day. We were with his family the day before and then with mine on the day of. We (including my parents, both my brothers and their girlfriends, my grandma) had a barbecue and then decided to sit around the fire pit to have dessert. When everyone was setting up the chairs around the fire, I ran inside and created the choco-board. I walked outside with plates and hid this under it. "Pete and I brought something special for dessert," I announced, then handed the chocolate to Pete who handed it to my mom. Now, let me tell you. My mom isn't one for subtlety. So she sat there looking at the chocolate for a lot longer than I anticipated. And that's when it happened, that awkward moment when you think maybe a text would have been better after all. "Oh!" she said. "You picked a date? Finally!" And she passed the chocolate around the circle so everyone could see. She actually still has the chocolate board on a shelf in the kitchen. She hasn't eaten it yet (and something tells me she isn't planning on it). 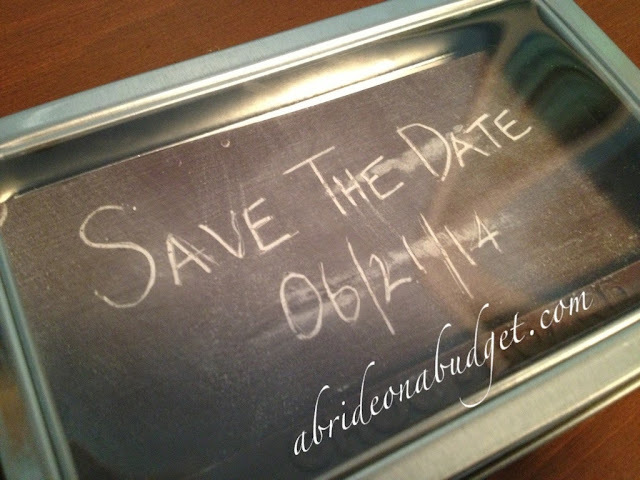 It was a super cute way for me to tell my family that we had a date picked ... and a way for me to tell you guys too. Yup, we have finally picked a date. The countdown is officially on. 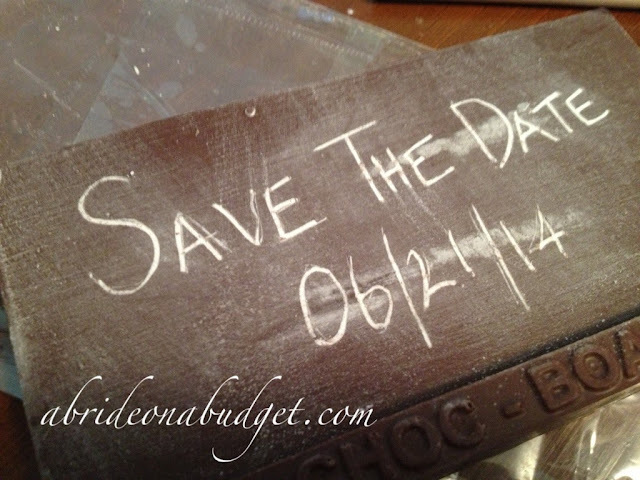 BRIDAL BABBLE: How did you tell your family that you picked a date? That is an awesome idea. I would of ate it, because I love chocolate. The temptation would of been too much for me. However, I can see why your mom saved it. You are her baby who is getting married. What a cute way to make any announcement! Hope you save the idea for your pregnancy announcement down the road! I love it! We discussed our special date before getting officially engaged and asked for family input since my entire family and lots of friends travelled far, so we wanted to be sure it worked for everyone's schedule!